Robust plasmonic nanoantennas at mid-infrared wavelengths are essential components for a variety of nanophotonic applications ranging from thermography to energy conversion. Titanium nitride (TiN) is a promising candidate for such cases due to its high thermal stability and metallic character. Here, we employ direct laser writing as well as interference lithography to fabricate large-area nanoantenna arrays of TiN on sapphire and silicon substrates. Our lithographic tools allow for fast and homogeneous preparation of nanoantenna geometries on a polymer layer, which is then selectively transferred to TiN by subsequent argon ion beam etching followed by a chemical wet etching process. The antennas are protected by an additional Al2O3 layer which allows for high-temperature annealing in argon flow without loss of the plasmonic properties. Tailoring of the TiN antenna geometry enables precise tuning of the plasmon resonances from the near to the mid-infrared spectral range. Due to the advantageous properties of TiN combined with our versatile large-area and low-cost fabrication process, such refractory nanoantennas will enable a multitude of high-temperature plasmonic applications such as thermophotovoltaics in the future. 24 November 2015: A correction was made to the title. M. Tame, K. McEnery, Ş. Özdemir, J. Lee, S. Maier, and M. Kim, “Quantum plasmonics,” Nat. Phys. 9(6), 329–340 (2013). S. Berweger, J. M. Atkin, R. L. Olmon, and M. B. Raschke, “Light on the tip of a needle: Plasmonic nanofocusing for spectroscopy on the nanoscale,” J. Phys. Chem. Lett. 3(7), 945–952 (2012). N. Liu, M. L. Tang, M. Hentschel, H. Giessen, and A. P. Alivisatos, “Nanoantenna-enhanced gas sensing in a single tailored nanofocus,” Nat. Mater. 10(8), 631–636 (2011). N. Li, A. Tittl, S. Yue, H. Giessen, C. Song, B. Ding, and N. Liu, “DNA-assembled bimetallic plasmonic nanosensors,” Light Sci. Appl. 3(12), e226 (2014). A. Tittl, P. Mai, R. Taubert, D. Dregely, N. Liu, and H. Giessen, “Palladium-based plasmonic perfect absorber in the visible wavelength range and its application to hydrogen sensing,” Nano Lett. 11(10), 4366–4369 (2011). K. Chen, R. Adato, and H. Altug, “Dual-band perfect absorber for multispectral plasmon-enhanced infrared spectroscopy,” ACS Nano 6(9), 7998–8006 (2012). R. Walter, A. Tittl, A. Berrier, F. Sterl, T. Weiss, and H. Giessen, “Large-Area low-cost tunable plasmonic perfect absorber in the near-infrared by colloidal etching lithography,” Adv. Opt. Mater. 3(3), 398–403 (2015). N. Liu, L. Langguth, T. Weiss, J. Kästel, M. Fleischhauer, T. Pfau, and H. Giessen, “Plasmonic analogue of electromagnetically induced transparency at the Drude damping limit,” Nat. Mater. 8(9), 758–762 (2009). C. Wu, A. B. Khanikaev, R. Adato, N. Arju, A. A. Yanik, H. Altug, and G. Shvets, “Fano-resonant asymmetric metamaterials for ultrasensitive spectroscopy and identification of molecular monolayers,” Nat. Mater. 11(1), 69–75 (2011). D. Lin, P. Fan, E. Hasman, and M. L. Brongersma, “Dielectric gradient metasurface optical elements,” Science 345(6194), 298–302 (2014). 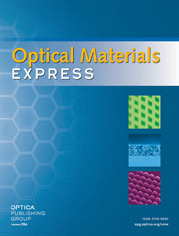 G. Naik, J. Kim, and A. Boltasseva, “Oxides and nitrides as alternative plasmonic materials in the optical range,” Opt. Mater. Express 1(6), 1090–1099 (2011). K. Appavoo, D. Y. Lei, Y. Sonnefraud, B. Wang, S. T. Pantelides, S. A. Maier, and R. F. Haglund., “Role of defects in the phase transition of VO2 nanoparticles probed by plasmon resonance spectroscopy,” Nano Lett. 12(2), 780–786 (2012). B. Gholipour, J. Zhang, K. F. MacDonald, D. W. Hewak, and N. I. Zheludev, “An all-optical, non-volatile, bidirectional, phase-change meta-switch,” Adv. Mater. 25(22), 3050–3054 (2013). N. Strohfeldt, A. Tittl, M. Schäferling, F. Neubrech, U. Kreibig, R. Griessen, and H. Giessen, “Yttrium hydride nanoantennas for active plasmonics,” Nano Lett. 14(3), 1140–1147 (2014). F. Sterl, N. Strohfeldt, R. Walter, R. Griessen, A. Tittl, and H. Giessen, “Magnesium as novel material for active plasmonics in the visible wavelength range,” Nano Lett. (2015), doi:. U. Guler, A. Boltasseva, and V. M. Shalaev, “Refractory plasmonics,” Science 344(6181), 263–264 (2014). S. Fan, “Photovoltaics: An alternative ‘Sun’ for solar cells,” Nat. Nanotechnol. 9(2), 92–93 (2014). W. Li, U. Guler, N. Kinsey, G. V. Naik, A. Boltasseva, J. Guan, V. M. Shalaev, and A. V. Kildishev, “Refractory plasmonics with titanium nitride: broadband metamaterial absorber,” Adv. Mater. 26(47), 7959–7965 (2014). M. Diem, T. Koschny, and C. M. Soukoulis, “Wide-angle perfect absorber/thermal emitter in the terahertz regime,” Phys. Rev. B 79(3), 033101 (2009). E. Rousseau, A. Siria, G. Jourdan, S. Volz, F. Comin, J. Chevrier, and J. J. Greffet, “Radiative heat transfer at the nanoscale,” Nat. Photonics 3(9), 514–517 (2009). C. Maus, T. Stauden, G. Ecke, K. Tonisch, and J. Pezoldt, “Smooth ceramic titanium nitride contacts on AlGaN/GaN-heterostructures,” Semicond. Sci. Technol. 27(11), 3264–3294 (2012). G. V. Naik, V. M. Shalaev, and A. Boltasseva, “Alternative plasmonic materials: Beyond gold and silver,” Adv. Mater. 25(24), 3264–3294 (2013). U. Guler, V. M. Shalaev, and A. Boltasseva, “Nanoparticle plasmonics: going practical with transition metal nitrides,” Mater. Today 18(4), 227–237 (2015). U. Guler, J. C. Ndukaife, G. V. Naik, A. G. A. Nnanna, A. V. Kildishev, V. M. Shalaev, and A. Boltasseva, “Local heating with lithographically fabricated plasmonic titanium nitride nanoparticles,” Nano Lett. 13(12), 6078–6083 (2013). S. Bagheri, K. Weber, T. Gissibl, T. Weiss, F. Neubrech, and H. Giessen, “Fabrication of square-centimeter plasmonic nanoantenna arrays by femtosecond direct laser writing lithography: effects of collective excitations on SEIRA enhancement,” ACS Photonics 2(6), 779–786 (2015). S. Bagheri, H. Giessen, and F. Neubrech, “Large-area antenna-assisted SEIRA substrates by laser interference lithography,” Adv. Opt. Mater. 2(11), 1050–1056 (2014). G. V. Naik, B. Saha, J. Liu, S. M. Saber, E. A. Stach, J. M. K. Irudayaraj, T. D. Sands, V. M. Shalaev, and A. Boltasseva, “Epitaxial superlattices with titanium nitride as a plasmonic component for optical hyperbolic metamaterials,” Proc. Natl. Acad. Sci. U.S.A. 111(21), 7546–7551 (2014). G. V. Naik, J. L. Schroeder, X. Ni, A. V. Kildishev, T. D. Sands, and A. Boltasseva, “Titanium nitride as a plasmonic material for visible and near-infrared wavelengths,” Opt. Mater. Express 2(4), 478–489 (2012). T. Weiss, G. Granet, N. A. Gippius, S. G. Tikhodeev, and H. Giessen, “Matched coordinates and adaptive spatial resolution in the Fourier modal method,” Opt. Express 17(10), 8051–8061 (2009). A. Mitsuo, S. Uchida, N. Nihira, and M. Iwaki, “Improvement of high temperature oxidation resistance of titanium nitride and titanium carbide films by aluminum ion implantation,” Surf. Coat. Tech. 103–104, 98–103 (1998). U. Guler, A. V. Kildishev, A. Boltasseva, and V. M. Shalaev, “Plasmonics on the slope of enlightenment: the role of transition metal nitrides,” Faraday Discuss. 178, 71–86 (2015). S. T. Sundari, R. Ramaseshan, F. Jose, S. Dash, and A. K. Tyagi, “Investigation of temperature dependent dielectric constant of a sputtered TiN thin film by spectroscopic ellipsometry,” J. Appl. Phys. 115(3), 033516 (2014). A. Tittl, A. K. Michel, M. Schäferling, X. Yin, B. Gholipour, L. Cui, M. Wuttig, T. Taubner, F. Neubrech, and H. Giessen, “A Switchable Mid-Infrared Plasmonic Perfect Absorber with Multispectral Thermal Imaging Capability,” Adv. Mater. 27(31), 4597–4603 (2015). Fig. 1 Schematic drawing of the fabrication process of TiN nanoantennas: (a) 50 nm thick TiN films are sputtered and 100 nm thick Au films are evaporated on a substrate. Subsequently, the photoresist is coated on top. (b) Exposure and development processes create the antennas mask in the polymer, which is transferred first to (c) Au via argon ion beam dry etching and then to (d) the TiN film by chemical wet etching. (e) The photoresist and (f) gold are removed by oxygen plasma and argon ion beams, respectively. Additionally, an oxidation-resistant layer can be deposited onto the TiN antennas to protect them from oxygen when annealing at high temperatures. Fig. 2 (a) Real (ɛ1) and (b) the imaginary (ɛ2) parts of the dielectric function of the 50 nm thick TiN films on silicon (blue line) and sapphire (red line) substrates extracted from the modeled spectroscopic ellipsometry measurements and extrapolated to 12 μm. (c) The measured optical properties of the TiN film are used to simulate the plasmon resonance (polarization of the electric field E|| is parallel to the antenna long axis) of nanoantennas with different lengths (L) using a Fourier modal method numerical simulation, resulting in tunable plasmon resonances from near- to mid-infrared in spectral range. The kinks in the simulated plasmonic resonances (panel c) are Rayleigh anomalies due to grating resonances. A cross section SEM image of the TiN film is shown as the inset in Fig. 2(b). Fig. 3 Simulated (a) and experimental (b) results of relative transmittance spectra of the 50 nm thick TiN antenna arrays fabricated by direct laser writing (parallel polarization, E||). The antenna lengths and widths are 0.83 µm and 200 nm, respectively, and the periodicity of antennas parallel to the antenna long (short) axis is 1.5 µm. Fig. 4 High-temperature stability of 50 nm thick TiN nanoantenna on sapphire substrate without protection layer as well as covered with 200 nm thick aluminum oxide (Al2O3). (a) The TiN nanoantennas (fabricated by direct laser writing) show a pronounced plasmonic resonance at a wavelength of around 3 µm (blue line). After annealing at 800°C the plasmon resonance vanishes due to the oxidization (red line). (b) When the sample is covered with a 200 nm thick Al2O3 protective layer, the resonance undergoes a spectral shift of around 0.5 µm to longer wavelengths combined with a slight broadening of the lineshape (blue line). Annealing at a temperature of 800°C induces only a small decrease of the modulation depth of the resonance (red line). Further annealing (green line) causes a degradation of the Al2O3 layer and consequently a blue shift of the plasmon resonance as well as a further decrease of the modulation depth (TiN antenna periodicity = 1.5 µm, length = 1.0 µm, width = 200 nm, height = 50 nm). Fig. 5 SEM images, relative transmittance spectra (experiment and simulation), and plasmon resonance positions of TiN antennas fabricated by direct laser writing lithography on a Si substrate are shown. (a) Relative transmittance spectra (parallel polarization, E||) of the selected antenna arrays show tunability of the plasmon resonances from the near- to mid-infrared. (b) The corresponding simulated spectra are in fair agreement with experiment. Deviations are due to the imperfect surface of the antennas created by the wet etching process. (c) The plasmon resonance position of the antenna arrays exhibits a linear dependence of the resonance wavelength on the antenna length. Selected antennas are labeled with the corresponding color from panel (a). The periodicity of antennas parallel to both the long and the short antenna axes is 1.5 µm, antenna lengths are varied from 0.2 to 1.35 µm, and the antenna widths and heights are 250 and 50 nm, respectively. Fig. 6 Large-area fabrication of TiN antennas by laser interference lithography on a Si substrate. (a) A photograph of the sample demonstrates the homogeneity of our antenna arrays over a large area (10 × 10 mm2). (b) Tilted view scanning electron micrograph of the fabricated TiN antennas (length: 1.7 µm, width: 0.8 µm, height: 50 nm). (c) Relative transmittance spectrum (parallel polarization, E||) of the fabricated antennas.